I want to say that RYOMA was just down the street from Shigeru, but in Takadanobaba, nearly every ramen shop is just down the street from the next ramen shop, that street being Waseda-dori. Ryoma is another somewhat "fancy" ramen shop, the kind of place that goes out of its way to attract women customers who are often considered to be intimidated by the masculine attitude, close quarters, sweaty clientele, and low standards of cleanliness that often get associated with more "traditional" ramen shops. 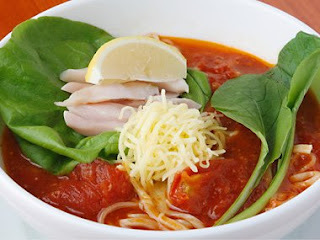 Seating is primarily at tables, rather than at the counter, and Ryoma offers some "healthy" alternative ramens, including a Tomato Ramen that looks like egg noodles floating in tomato paste, but is probably more delicious than that. 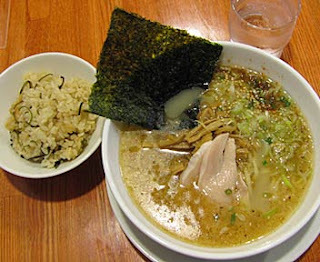 Ryoma specializes in shio (salt) ramen, which has always sat at the bottom of my personal hierarchy of ramen styles, though to be fair, perhaps because of my bias against it, I rarely ate it, so didn't have much ground to stand on in my criticism. Ryoma's noodles were surprisingly tasty, and, to be honest, forced me to reconsider my views on shio ramen. It was satisfying without being too heavy, like tonkotsu (pork broth) ramen often is, and the noodles had a satisfying heft to them. I'm not sure, since I ordered with no meat topping, but I think they may substitute chicken for the traditional pork châshû. It's been a while, but I also remember some roasted garlic adding to the flavor. All in all, a surprisingly satisfying ramen, and something extra must be said for a bowl of noodles that forces me to consider reorienting my entire structure of soup preference. I definitely want to go back some day just to see what the tomato ramen must be like.